Our Website is registered in Malta. josephvella.com.mt has been created for informative purposes. The Website highlights the work of Mro. 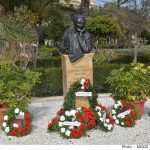 Joseph Vella, his compositions, his discography, a gallery of portraits and events, as well as an updated news section informing readers of the latest events and activities related to the music of Joseph Vella. The content of this Website is suitable for all ages. As required by GDPR regulations, any readers under the age of 16 needs their parent or guardian’s permission to view the site. The Website does not knowingly collect any personally identifiable information from children under the age of 16. If a parent or guardian believes that the Blog has personally identifiable information of a child under the age of 16 in its database, please contact us immediately. We will use our best efforts to promptly remove such information from our records. The Website does collect any data relevant or necessary to operate a mailing-list. Indeed, there is no mailing-list function associated with this Website. No contact forms are available on this Website. Users may contact [email protected] for any enquiries. The Website uses third-party service providers to service various aspects of josephvella.com.mt. Each third-party service provider’s use of your personal information is dictated by their respective privacy policies. At josephvella.com.mt we give our best efforts to ensure the plugins and third-party apps used are GDPR compliant. This Website abides by GDPR regulations, so if you wish to have your information removed (e.g. comments), whether you are an EU resident or not, please get in touch with us. We are happy to amend/remove your information (if any) if you contact us. We do not retain secondary copies of comments/reader contact information without permission. Similarly, we do not resell or share your contact information with third parties (if in anyway we come in contact with such). We care for your data. We have never sold, We are not selling, and We will not sell any of your personal data which you have provided to us. As the users of this Website have no possibility to register, no sensitive personal data is being collected. Nonetheless, if you suspect that we may have any such information, you can request to receive an exported file of the personal data we hold about you (if any at all), including any data you have provided to us. You can also request that we erase any personal data we hold about you (if any at all). This does not include any data we are obliged to keep for administrative, legal, or security purposes. Visitor comments may be checked through an automated spam detection service. Copyright ©2018 Joseph Vella and Heirs. All content in this Website is owned by the heirs of Mro. Joseph Vella. All rights reserved.